Street Views: 6 and 15 Suppl. 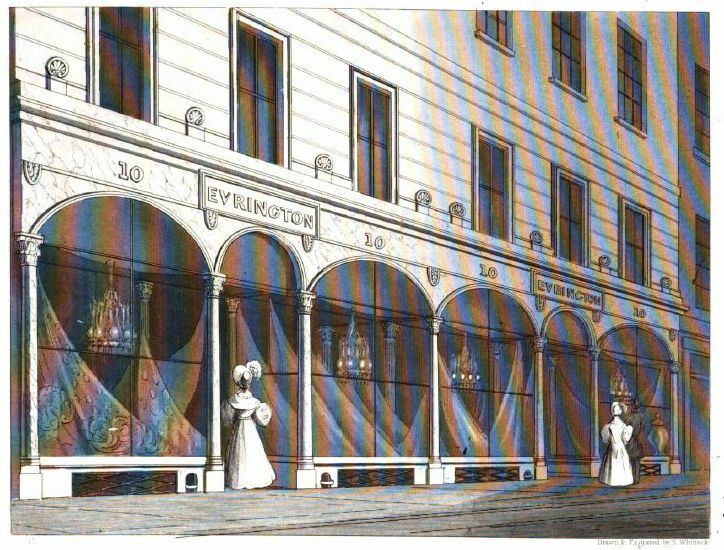 Everington advertised in 1817 with Irish linens that he had obtained cheaply because of “the great depression in the price of Irish linens”. 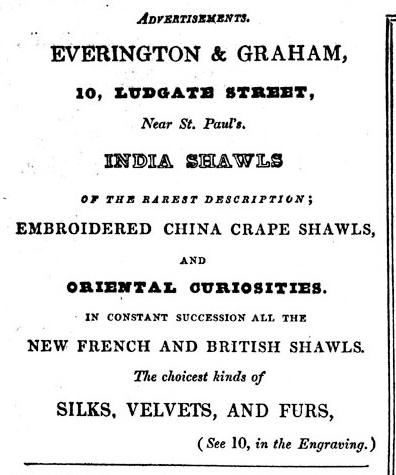 (2) And two years later he has bought up “the whole of the elegant Cachemere Shawls, sent to her Majesty as presents from the different Foreign Courts”. The shawls had been Queen Charlotte’s who had died in November 1818. (3) Things went well for Everington as in 1834, the Sun Fire insurance records suddenly hve him of 9 and 10 Ludgate Street. 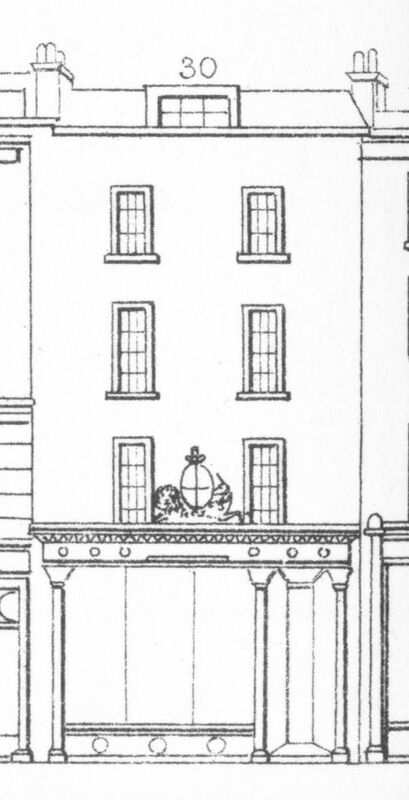 If we compare the frontage of the shop in the bill head below with the elevations Tallis depicted for the shop, you can see the difference. 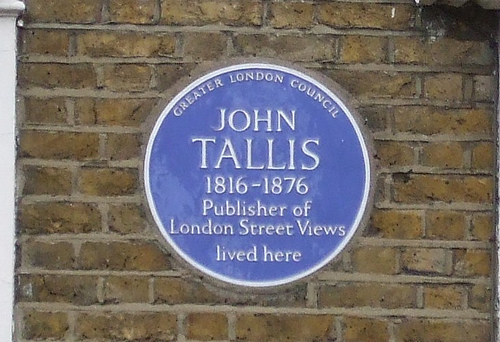 It is telling that number 9 (the right-hand side of the building in the Tallis elevations) has disappeared from the Tallis Index as if completely incorporated into Everington’s number 10.
the projector of this front exercised considerable ingenuity and skill in raising the windows so much above the brestsummer(4), and adding to their light and elegant effect by a concave ceiling. 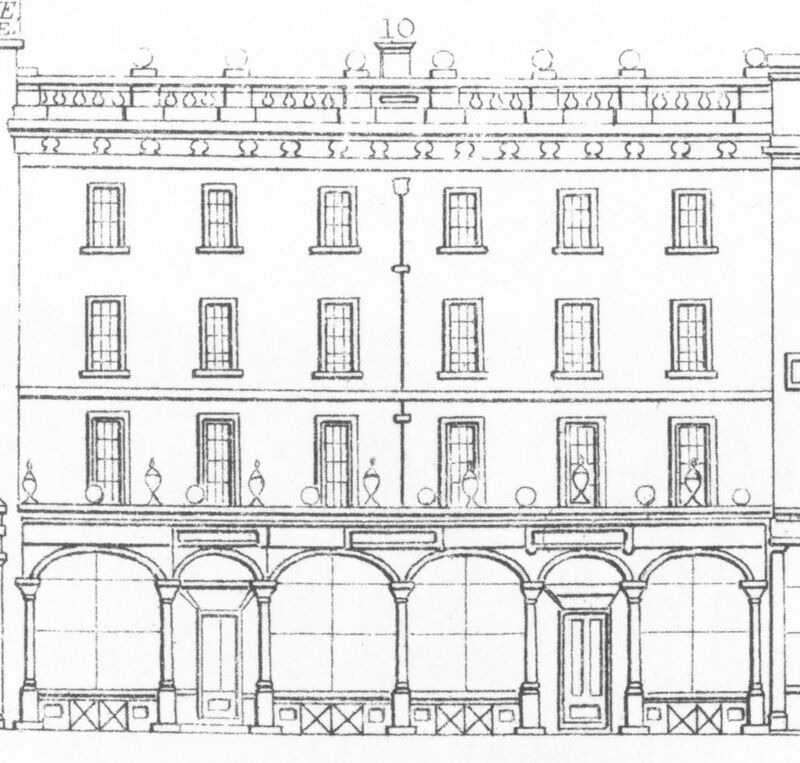 The height of this front is obtained by intrenching on the windows of the first floor, yet by a skilful alteration of their form, they do not appear unsightly. The whole front is coloured in imitation of white-veined marble; the name and ornaments are gilt. At some point John Graham may have entered into a partnership with George Smith. 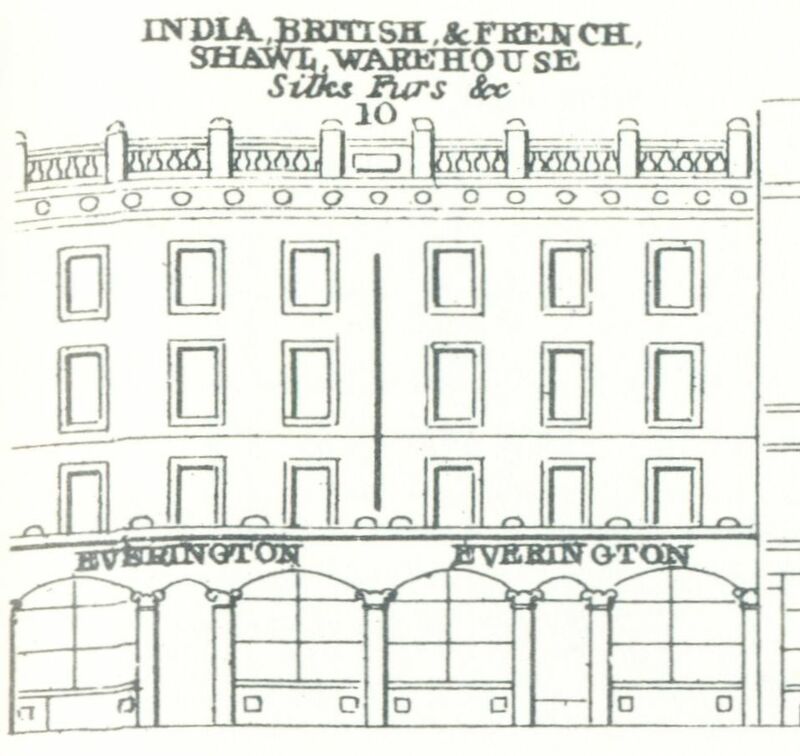 That partnership was quickly dissolved again, and in an 1845 advertisement George Smith describes himself as ‘late Graham and Smith, successors to Everington’ and now trading from 32 Ludgate Hill, the shop previously occupied by Rundell and Bridge. (7) The following year, Smith had a very unusual visitor in his shop: a large Durham cow came in, walked round the shop and exited through another door without doing any damage to the china jars and glass on display. 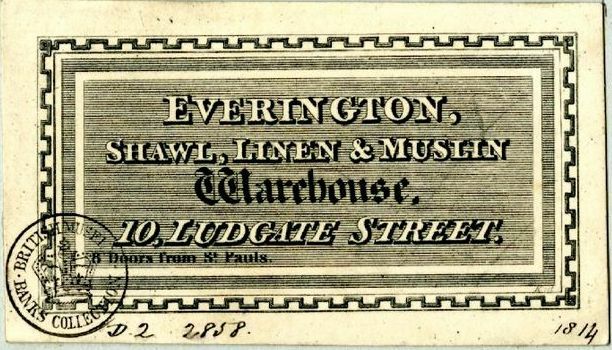 (8) The Era of 29 August 1847 relates a story about an American lady who bought a shawl from the “ruination shop of Everington on Ludgate Hill” which elicited smirks from passers-by as she had failed to remove the price ticket, but the 1851 and 1861 censusus still see John Graham, his family, and a large workforce, living at 9 & 10 Ludgate Street. As no house number is given in the notice about the end of the partnership, nor in the story about the American, nor in the advertisements by Smith, these stories may have been about another Everington, as there were more Everingtons trading in the area. In 1870, John Graham’s son, John junior, described as a shawl warehouseman, married Amy Attenborough. She was the daughter of Robert Attenborough, the pawn broker who featured in a previous post. The couple had two daughters, but all was not well. In 1875, divorce proceedings were started in which Amy, who was then living with her father again, claims that John threw a bottle of wine at her and that he, on various occasions, had hit her and that she had therefore left him. As can be expected, Graham denied the allegations and alleged that Amy was “a woman of extravagant habits and violent temper” who “habitually neglected her children and her household duties”, and that she was the one doing the hitting. And to top it all, she also had an affair with one Petrocochino, something Petrocochino and Amy denied. Amy continued to call herself Amy Graham, at least she did in the 1881 census when she is still living with her father, and given as ‘unmarried’. John junior and his father can be found at Brockhill Farm, Warfield, Berkshire, in the 1881 census (Google Street View here). John senior is listed as a retired shawl merchant and John junior, ‘unmarried’, is now a farmer, employing 4 labourers and a boy. In the 1891 census, Amy is still living with her father at 56 Avenue Rd, claiming to be a widow. The research on this post once again found unexpected links between London shopkeepers, an aspect of this blog that continues to amaze me and had not expected at all when I first started writing. I hope to show more interconnections in the future. (1) Parliamentary Papers 1780-1849, Volume 8: Report from the Select Committee on East India Produce, 1840. (2) The Morning Chronicle, 6 January 1817. (3) The Morning Chronicle, 23 February 1819. (4) Brestsummer is a variation of bressummer ‎(plural bressummers), a term used in architecture for a large, horizontal, supporting beam which bears the weight of a wall starting on a first or higher floor. (5) The London Gazette, 6 January 1843. (6) England & Wales, National Probate Calendar (Index of Wills and Administrations), 1860. Estate valued at under £180,000. (7) The London Gazette, 22 October, 1844; The Examiner, 28 June 1845. (8) Glasgow Herald, 16 February 1846. (9) Frank Robinson married Catherine, daughter of James Attenborough; his brother Peter married Fanny, the sister of Amy. Both left their wives and established illegitimate families with other women. I am grateful to Nick Thomson for supplying the information on the Graham/Robinson/Attenborough links. 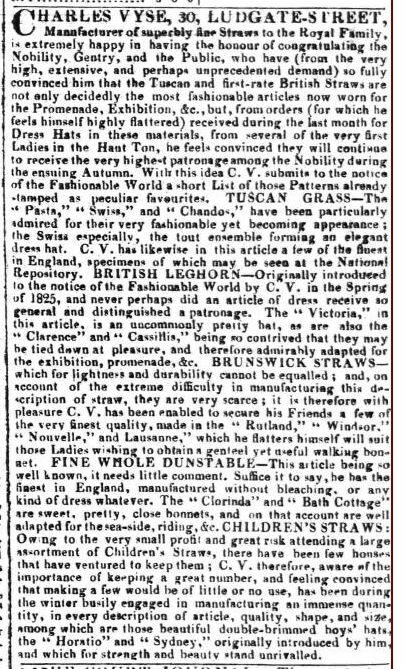 Straw hats were quite a craze in Victorian England and Charles Vyse’s was one of the many shops where you could buy one. The straw suitable for making bonnets was mainly manufactured in Bedfordshire; the St. Albans, Dunstable and Luton areas are frequently named as sources of either the raw material or the finished product. The main disadvantage of growing the wheat for the straw in England was the climate. Although a single thunderstorm would not damage the wheat enough to prevent it from being milled into flour, damp could cause the straw to become rusted or spotted. Very dry weather would cause the straw to become very stiff or turn an undesirable reddish colour. If the conditions were favourable, however, and the farmer quickly got the dried straw tied into sheaves and stored or despatched to the straw pleaters, he could get from an acre of wheat “five to eight loads of wheat, of five bushels to the load, and from fifteen cwt. to a ton of cut straw, of the value of six to eight pounds stirling the ton, clear of all expenses”. 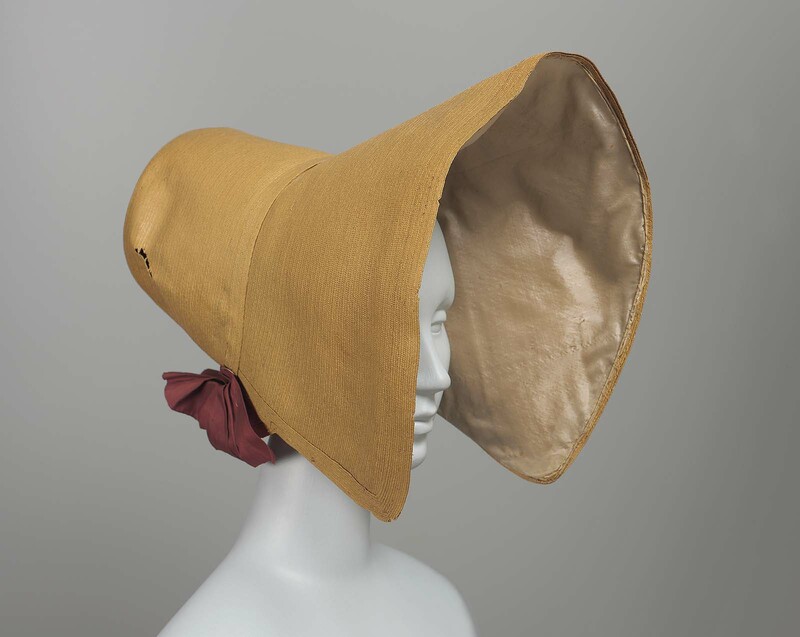 (1) But straw bonnets were not just made in England; many were imported from Italy, specifically from the Leghorn area (Livorno, Tuscany) after which they were named Leghorn bonnets, or just Leghorns (examples here). 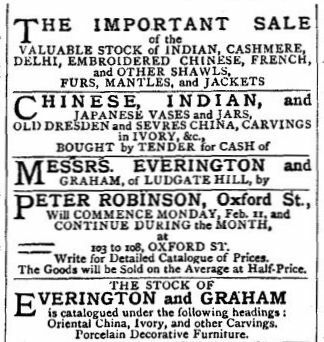 Advert in The Morning Post, 21 July 1829. Click to enlarge. Charles died in July 1850 at the age of 66 and left his entire business during her lifetime to his wife Mary and after her death to his children. (5) There was however, one condition: his son Edward(6) was not to be a partner, but was to receive a salary. Was Edward not trusted with the business? Not sure what happened to Edward, but at the time of the 1851 census, Mary is listed as the head of the household with son Augustus as manager. (7) The 1851 census does not help very much with the whereabouts of Valentine, Augustus’s younger brother, as he is seen visiting a family in Lambeth, so where he actually lived remains unclear. His occupation is given as bankers’ clerk. Valentine marries Anne Cornish Saunders, the daughter of a chemist, on 5 January 1851 at St. Peter le Poer. Both their addresses are given as Old Broad Street. It is quite possible that any combination or all of the brothers Edward, Valentine and Augustus ran the business together for their mother as an advertisement in the 1851 Official Descriptive and Illustrated Catalogue of the Great Exhibition mentiones the firm as “Messrs. Vyse”. The Land Tax records list Mary Vyse for the Ludgate property up till 1858, after which Valentine takes over. Edward and Augustus disappear from the records and Valentine seems to take over the business on his own. And then disaster struck. Around 7 June 1862, a short notice appears in various newspapers, reporting that Mrs Vyse of Ludgate Hill had been committed to Newgate on a charge of wilfully murdering her children. Other papers suggest that she remained in her own house in the charge of a hospital nurse. What happened? The reports in the newspapers vary in detail and chronology, but I will draw upon Reynolds’s Newspaper of 13 July 1862, which seems to have carried the most comprehensive (and reliable?) 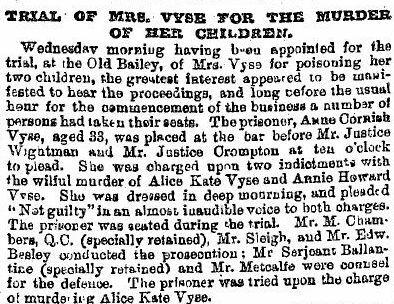 account of Anne Vyse’s trial. Valentine and Anne had at the time of the murder five children, but Ann had only brought her two daughters, Alice and Annie, up to town to show them the Exhibition. It later transpired that another child had also been in town, but he was at school during the afternoon. On the 22nd of May, Mrs Vyse went to Keating’s, a chemist in St. Paul’s Churchyard, where, after buying some perfume, she asked for something to kill rats. When suggested some poisoned wheat, she said she had tried that, but to no avail. She was then shown Battle’s Vermin Powder of which she bought three packets. She was cautioned by the chemist’s assistent that it was dangerous stuff. In the afternoon, she sent the servant to get another packet of the same. The servant, returning with the purchase, went to her mistress’s room, but was told not to come in. Her suspicions were aroused and she called Mrs Sarah Saunders, Mrs Vyse’s sister, who forced open the door. They found Anne Vyse standing over the washstand, bleeding from the throat, with a razor in her hand. The children were found dead in their beds, fully clothed. An analyses of their stomachs found large quantities of strychnine. The defence at the trial was that Mrs Vyse was pregnant “and that was a circumstance and a time calculated to produce great depression of the brain”. She had also lost a child to diphteria in 1860 which much affected her. Also, in the past, a cousin had intended to commit suicide and another had been confined in a lunatic asylum. More witnesses were called and all could mention a (distant) relative of Anne who committed suicide, was insane or at best, excentric. In other words, Anne Vyse’s actions could only be explained by insanity. The defence lawyer realised that an insanity verdict would mean confinement for life, but he could not argue any other way. The jury agreed and Anne was found not guilty on the grounds of “insanity at the time of committing the act”. The prisoner was to be “confined as a criminal lunatic during the royal pleasure”. Put away at Broadmoor for life one would assume, but not so. The 1871 census shows Anne living with Valentine and a growing family at Wimbledon. Also at the address is Sarah Saunders, the sister who kicked in the door in 1862. One of the children, Sidney, is 8 years old, so he was probably the child Anne was pregnant with when she committed the crime. In 1868, another child was born to the couple, Sallie Louise, and I do hope that a permanent eye was kept on Anne for the children’s sake, although nothing untowards seems to have happened after 1862. Anne died in 1889 and was laid to rest in the same grave as the two little girls she killed. Valentine himself died in 1918. (1) A.J. Tansley, “On the straw plait trade” in The Journal of the Society of Arts, no. 422, vol. IX (1860), pp. 69-73. (2) Baptised 4 April 1829 at St. Andrew’s Holborn as the son of Charles Vyse, Leghorn merchant, and his wife Mary. (3) The London Gazette, 18 May and 13 August 1847. (4) The Morning Post, 11 October 1849. (5) He was buried at Norwood Cemetery on 11 July 1850. (6) I have not found a baptism or burial record for Edward. (7) Augustus was baptised 6 April 1827 at St. Andrew’s Holborn. 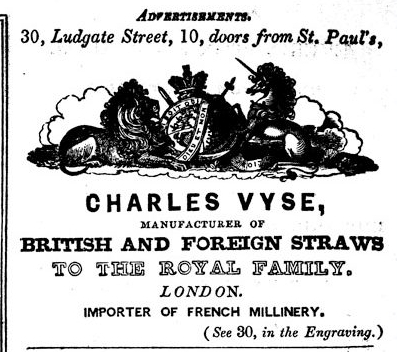 You may also like to read the post on Charles’s brother Thomas Vyse, another straw bonnet manufacturer.